Looking for St Patricks day desserts or even green desserts? 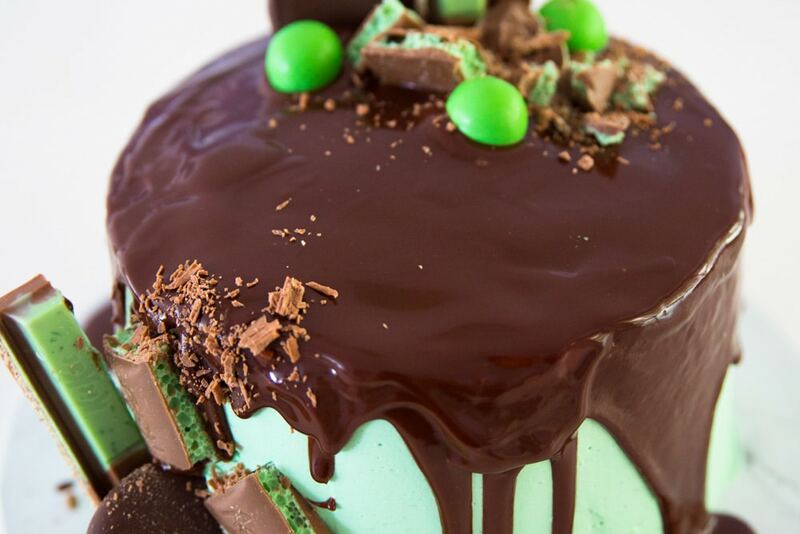 Try our fun St Patrick’s day cake for something a little different to Irish dessert recipes. 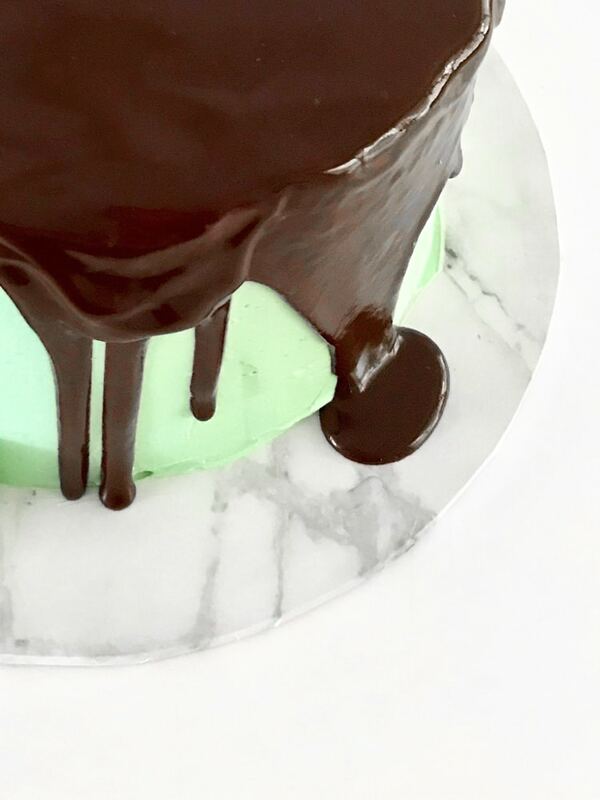 You won’t need the luck of the Irish this St Patrick’s day with our easy and delicious chocolate mint cake. Creating some special St Patrick’s food is a fun and easy way to celebrate this delightful Holiday. Our St Patrick’s Day cake has just the right amount of Irish green and huge WOW factor. The 17th of March is the day that we observe St Patrick, the patron Saint of Ireland’s death. He is known for converting the Irish to Christianity in the 5th century and there are many tales around him, such as getting rid of all the snakes in Ireland. When immigrants from Ireland came to places like America this day became a day to celebrate all things Irish! St Patrick’s day desserts are a fun way to get into the Irish spirit with friends or at a St Patrick’s Day party. 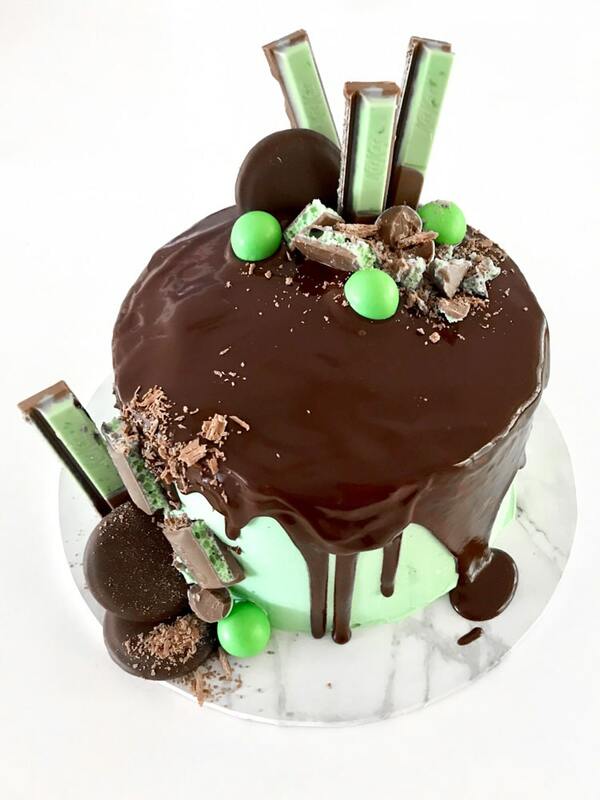 We tried something different to traditional Irish desserts, with this easy drip cake that makes amazing St Patrick’s day treats. Firstly you will need one or two chocolate cakes depending on how high you want your cake to be. Choose a recipe for St Patrick’s day cupcakes or cake. You can bake your own using gorgeous recipes such as this ‘Best Chocolate Cake Recipe Ever’ from Add a Pinch. We love this one as it also gives the option for gluten-free, dairy-free and egg-free cakes too. Or if you are pushed for time, buy plain, un-iced chocolate cakes from your local bakery or store ( we won’t judge, promise). Looking for more delicious ways to celebrate St Patricks Day? Check out our St Patrick’s day meals here. Once you have your layers you can start decorating. You will need some Buttercream. If you have a favourite recipe use that but be sure to make this a stand out amongst St Patrick’s desserts by adding the Green Food dye and Peppermint Essence. If you don’t have a buttercream recipe try ours below. With electric beaters, beat the butter in a bowl until a soft and fluffy texture. Slowly add the icing sugar until the butter goes a light colour and is creamy. Next, add the milk and keep beating until mixture is smooth. Add the green food dye and peppermint essence until the cream is the colour and taste you want. Note: You may need more or less buttercream, depending on the height of your cake. To put the Saint Patrick’s Day cake together. Firstly, cut each cake in half and make sure the layers of cake are flat, by trimming off any rounded tops. Next place your bottom layer on a cake stand. Spread some of the butter cream on the top of this and top with your next layer of cake. Press firmly but gently to make sure it is securely in place. Repeat with the number of layers you want your cake to be. Next spread a thin layer of buttercream over the entire cake for a crumb layer, covering the top and sides. Use a cake scraper to level this layer and pop into the fridge to chill for around 1 hour. Finally, remove the cake from the fridge and apply your final layer of buttercream. You will need a thicker layer of buttercream for this level and the cake scraper again to create a smooth finish. If you need help getting a perfect smooth buttercream look, we love this clip from Sweet Bake Shop. Pop your cake back in the fridge to set while you create the chocolate drizzle. Mix ingredients in a heatproof bowl and melt until smooth. Either in a microwave on high for around 1 minute or over a pan of boiling water on the stove. Allow to cool to room temperature before the next step. Take the cake from the fridge and pour the chocolate drizzle over the top of the cake. Pour in the centre of the cake and with a palette knife, slowly draw the chocolate to the edge of the cake, letting it drizzle over the sides. For the final touch let your imagination run wild. We added mint biscuits, choc-mint balls, mint Kit Kats and Aero but you can add whatever you prefer. If you need to stick things to the side of the cake, a little bit of buttercream should work. 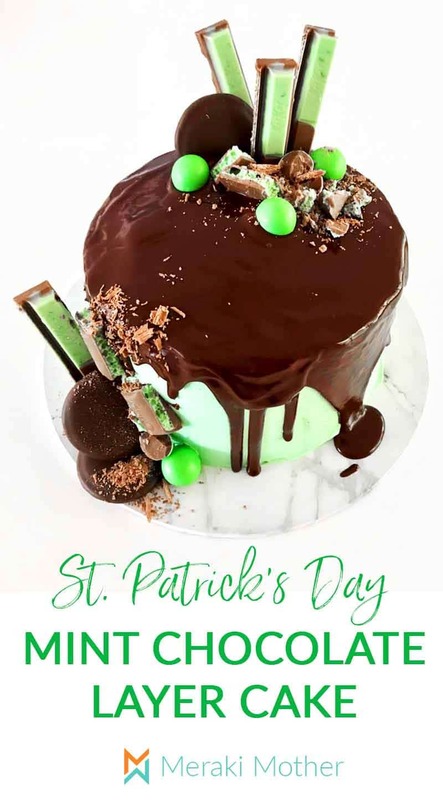 You could even add a splash of colour with some rainbow confectionary, no need to search for a pot of gold though with this delicious St Patrick’s day cake! Looking for fun ways to celebrate St. Patrick’s Day with young kids? Check out our Saint Patrick’s Day Activities for Preschoolers post now. We also recommend checking out our Rainbow Toast here.